Inspired by our Pasta alla Norma, this recipe adds sweet red peppers and savory pancetta make this simple sauce delectable. 1. Fry eggplant, set aside. 3. When pancetta browned toss in the onions and sauté the onions, garlic and optional hot pepper flakes. 3. Once the onions show transparency and the garlic softens, add the peppers, mix well and cover..
4. When the pepper begin to soften add 1 cup of white wine (Pinot Grigio) and let return to a simmer. 5. After a few minutes, add 1 cup of chicken stock and let return to a boil. 7. While the sauce is simmering add the basil and lemon juice. Taste and add salt and pepper to taste (if needed). 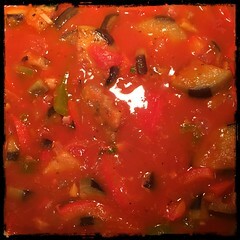 8. let cook for 5-minutes or so before adding the cooked eggplant. 9. Cook the pasta and let sauce continue to cook as well, you may need to add 1 cup of water. 10. Serve the grated Ricotta Salata or Pecorino Romano cheese!